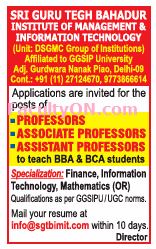 Sri Guru Tegh Bahadur Institute of Management and Information Technology, Delhi has advertised in THE TIMES OF INDIA newspaper for the recruitment of Professor/Associate Professor/Assistant Professor job vacancies. Interested and eligible job aspirants are requested to apply with in 10 days. Check out further more details below. About College: Sri Guru Tegh Bahadur Institute of Management & Information Technology, a SIKH Institution, was founded by the DSGMC, with the primary objective of providing University Education in a nice atmosphere for deserving students irrespective of caste and creed. It started functioning in 2008 with just 120 students on the rolls in two undergraduate courses of BCA & BBA.